Hanif Abdurraqib, Ruth Awad, Kristen Lepionka and David Weaver at Upper Arlington. Yes, just like Nelson in his famous song, Ohioana is on the road again! To be exact, a number of Ohioana Book Festival authors are on the road! 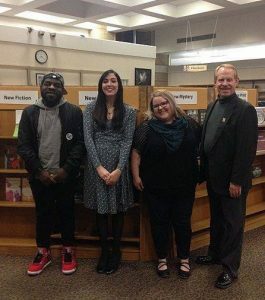 Our round of outreach appearances with festival authors kicked off April 4 at Upper Arlington Public Library with Hanif Abdurraqib, Ruth Award, and Kristen Lepionka in a lively “New Voices: Ask the Authors” conversation moderated by Ohioana Director David Weaver. It’s all part of the fun and excitement leading up to the main event – the 2018 Ohioana Book Festival on Saturday, April 14, from 10:30 a.m. to 5:00 p.m. at the Sheraton Columbus at Capitol Square. We’ll see you there!